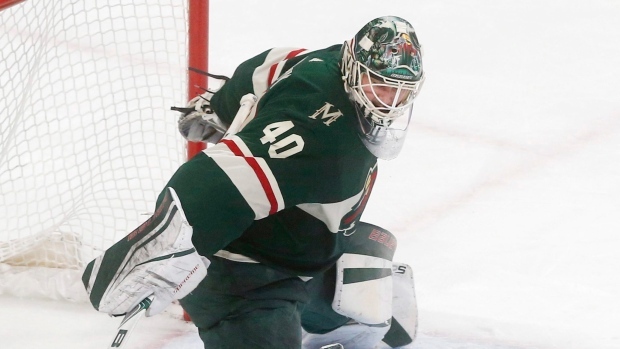 ST. PAUL, Minn. — Devan Dubnyk and the Minnesota Wild are getting plenty of practice in defending three-goal leads. Dubnyk made 32 saves, and Minnesota's three-goal advantage held up for the third straight game as the Wild beat the New York Rangers 3-2 on Tuesday night. Eric Staal, Zach Parise and Marcus Foligno all scored in the first 6:17 for the Wild, who ran their home point streak to a franchise-record 13 games (10-0-3). "We'll take three-goal leads every game," Staal said. "We'll do that every time. That's fine. Three's a big hill. For us to be able to come out with that lead and to be able to get that, it's big. "Human nature, I think, is sometimes you sit back and the other team's got nothing to lose so they're going for it. You can get on your heels a little bit, which we did, I think, a little bit." "We beat ourselves," Lundqvist said. "It's tough, especially the way we played for 45-50 minutes. That's the way we need to start, and it's on all of us, me not coming up with the extra save." Minnesota hasn't lost at home since Dec. 16 against Edmonton and owns the league's longest home point streak of the season. The Wild have outscored opponents 49-25 during the run. With 3-0 leads at home, Minnesota lost in overtime to Arizona on Thursday and followed with a shutout of Chicago on Saturday. New York pressured, outshooting the Wild 19-8 in the second period when Hayes scored his goal to bring the Rangers within one. "The message was the same as I've been telling them lately," Minnesota coach Bruce Boudreau said. "Do you want to keep on going on like this and getting 40 shots on goal a game? Having to fight. You get a 3-0 lead and fight to keep it. It's not the right way to play. If we're playing the right way, something good will probably happen." The Wild clamped down in the third, giving up just four shots. "The third period was fantastic," Dubnyk said. "Real good dialogue in here between all the guys going into the third, and we just wanted to go play. We spent the majority of the period in the neutral zone or in their end, and that's I'm sure frustrating for them. That was picture-perfect when you have a lead." Staal scored his 25th goal of the season three minutes in after getting the puck near the Wild's own blue line and tipping it past defenders twice on his way to the net. Staal has a four-game point streak and five goals in the past six games. Parise added his third of the season less than two minutes later when he was in on the forecheck and poked at the puck in Rick Nash's control, and the puck got by Lundqvist. After Foligno made it 3-0, Gilmour scored his first goal with a big slap shot from the point to cap the scoring in the first. "As a coach, you want your players to give you what they have," Rangers coach Alain Vigneault said. "I thought those young guys are learning every minute they're on the ice, and they did some good plays with and without the puck." NOTES: Minnesota D Nick Seeler made his NHL debut a day after being recalled from the American Hockey League. Seeler, raised in Eden Prairie, Minnesota, was a fifth-round draft choice by the Wild in 2011. He becomes the 25th native Minnesotan to play for the Wild and the 51st Minnesota-born player to play in the NHL this season. ... Seeler made it eight native Minnesotans in Tuesday's game. According to the Elias Sports Bureau, the eight Minnesota-born players to suit up matches the most for a game involving the Wild, a feat that first occurred on Dec. 9, 2014 against the New York Islanders. Seeler, Parise, Matt Cullen, Nate Prosser and backup goaltender Alex Stalock were the Minnesotans for the Wild. Brady Skjei, Neal Pionk and Vinni Lettieri were the Minnesotans for the Rangers. Minnesotans Ryan McDonagh (New York) and Mike Reilly (Wild) were scratched. ... Pionk recorded his first career point with an assist on Hayes' goal in the second. It was his third NHL game. ... Foligno played in his 400th career game. Wild: Host Washington on Thursday night.